SAW PALMETTO Most researched, effective herb for prostate health in its purest, solvent-free supercritical extract form. GREEN TEA Offers 51 inflammation modulating phytonutrients, with critical anti-aging and prostate-specific health benefits. STINGING NETTLE Two extracts provide fullest spectrum of inflammation modulating prostate-specific phytonutrients, with demonstrated clinical benefit in conjunction with saw palmetto. GINGER According to USDA and major university phytochemical databases, this is nature's richest herbal source of 5-LO modulators (24 phytonutrient modulators). 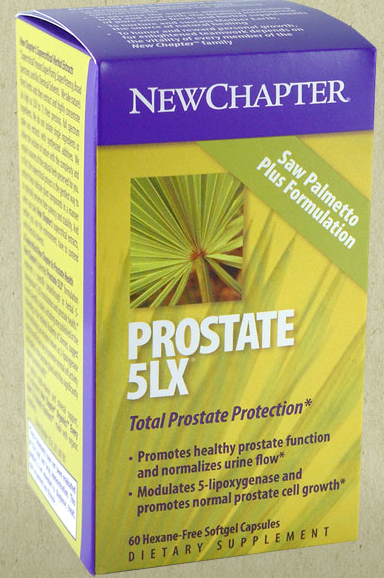 SELENIUM Probiotic Nutrients™ trace nutrient critical to tissue detoxification and long term prostate health. ROSEMARY Contains numerous anti-aging constituents and significant 5-LO modulators. Plus: Pumpkin seed oil and extra virgin olive oil have numerous prostate health benefits and multiple 5-LO modulators. One softgel, two times daily. Take in the middle of a larger meal with an 8 oz. glass of water. † Nutrients cultured in media that may contain: organic milled soy, organic yeast (Saccharomyces cerevisiae), organic maltodextrin, organic gum acacia, enzymes, and Lactobacilli (L. acidophilus, L. bifidus, L. rhamnosus). Other ingredients: Olive oil-extra virgin, maltodextrin, yellow beeswax, and organic sunflower oil. Capsule: Gelatin, vegetable glycerine, water, and carob. I've been using different prostate soft gel but this one is bit different because it's got all the essential herbs for a strong prostate. After starting this product feel a difference and a few weeks ago and I have noticed that this do not upset my system. I’ve also seeing that I don’t need to get up mainly in the middle session of night like before and that is the main achievement for me due to New Chapter Prostate. I also referred this stuff to some of my friends and amazed with the result.